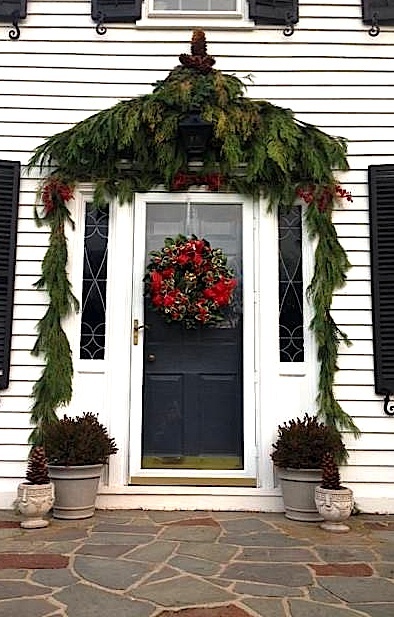 The Relished Roost: Christmas Door Decor! I just love seeing everyone's Holiday Door Decor! From simple to elaborate it just brings the entry way to life. I had some fun putting together my door this year. 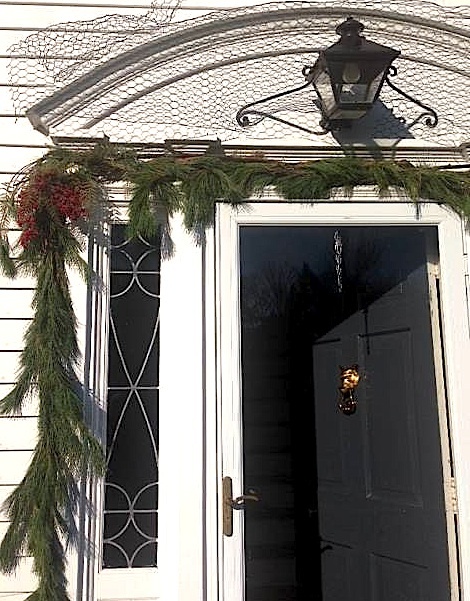 With the help of my husband holding that ladder steady I decided to dress up the door pediment in a style influenced by a pagoda topper. Here is a little step by step on how that came to be. First it started with a measured to scale drawing so I go figure out how many loose greens and pine roping to purchase. One definitely needs green chicken wire, good pliable and easily cut wire and plenty of nails with large heads but thin stems so as not to ruin the wood around the door. 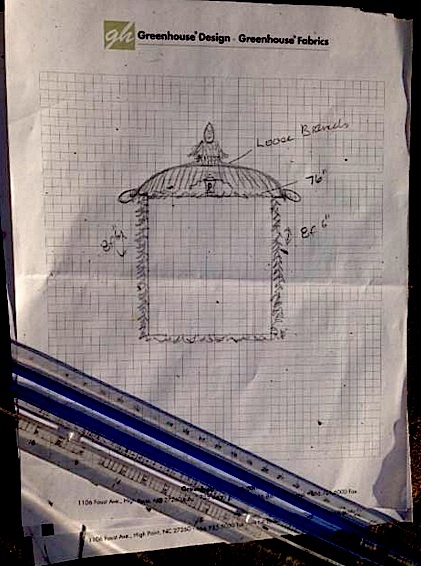 First the roping and berries were attached to rim of frame and them I measured and cut chicken wire to fit the pediment. I was able to actually weave the loose greenery into the holes and it stayed secure without having to wire in. 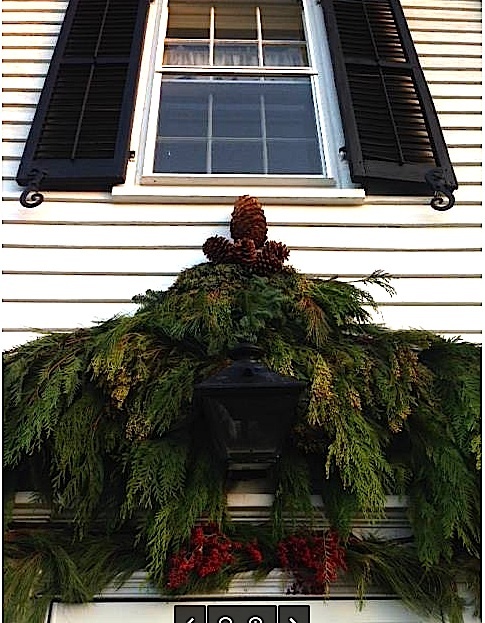 Next I bundled loose greens together in a fan shape with wire and used floral wire to pull together the pinecones. 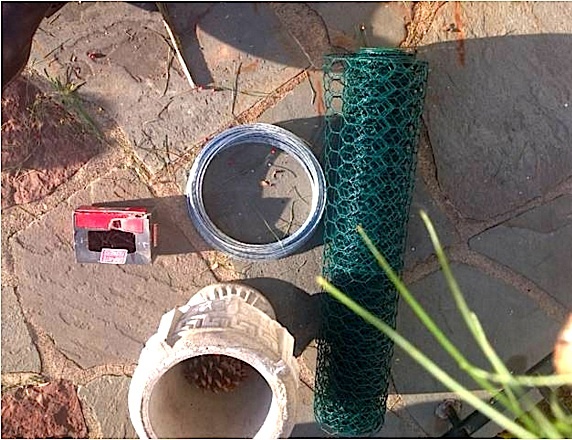 The large pine cone was wired secure with heavier gauge due to weight. First the topper was secured to a nail in clap board and then all the greenery was woven into chicken wired from largest to smallest as filler. The Holly wreath just added that extra punch of color I needed. 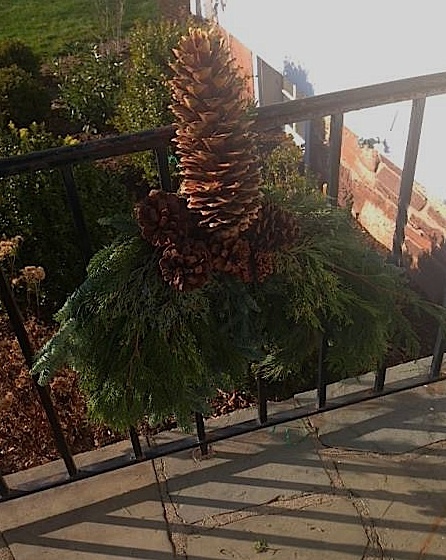 Simple large pinecones in planters because I didnt want planters to compete with door. I hope everyone is deep breathing during this time of year remember to spread a little Peace we really need it. 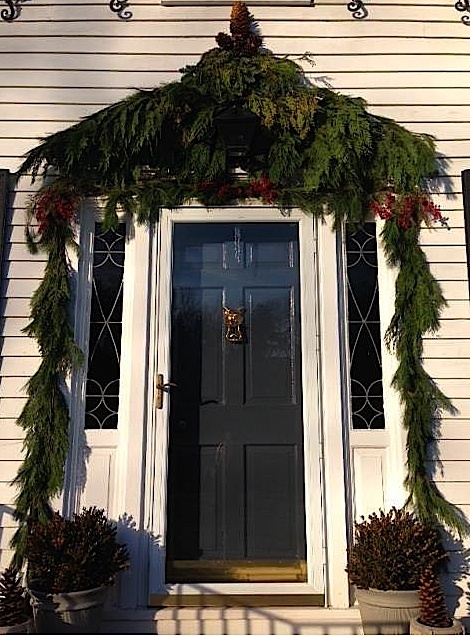 This project for your Holiday Door decor is just perfection Karolyn. I was thrilled when I saw the Pagoda pediment!! Beautifully done Karolyn!!! You're such a talented lady! This is absolutely unbelievably over-the-top awesomeness!! Love it!